Love in the Time of Pastry. Often, I feel a natural pull toward the kitchen to get creative and make something sweet. I have an insatiable sweet tooth, admittedly. This desire generally peaks after I’ve gotten home from a full day of activities, donned my sweats and T-shirt, and simply cannot bear the thought of leaving my cozy apartment to be assaulted by the bright lights of a grocery. Oh, and people. Not that I am an unsociable person, quite the opposite. It’s just that once I’ve expended my mental and emotional energy of the day, I need a respite. That’s when having a somewhat decently-stocked pantry comes in handy. Given that it’s Fall, I naturally turn to more things like pastries and pies and cakes; something fruity and not too sweet. I surveyed my cupboard and had odds and bits of different types of flours, a few apples in the refrigerator and a stick of butter. What emerged is destined to repeat, for sure. These apple galettes are quite possibly one some of best mini pastries I’ve made; perfect for breakfast, after dinner, or pretty much any time of day, really. Feel free to substitute a combination of flours with this one; I’m thinking rye flour might be a nice addition. However, if using a dense whole-grain flour, don’t add more than ~1/3 cup, or you’ll need to play with the fat and liquid components of the pastry dough. Ooh! And adding some candied ginger to the filling might be nice as well. I would go for about two tablespoons, and cut back on the sugar by equivalent volume. And I would hold off on adding the grated ginger, as is it might be a bit overpowering. 1. Combine all of the filling ingredients; set aside. Cut chilled dough into four equal pieces. Roll into ~1/8-in thin circles, You’ll want them to be about 8 inches in diameter. Line a baking sheet with parchment for the pastry, or put each circle onto individual parchment squares. 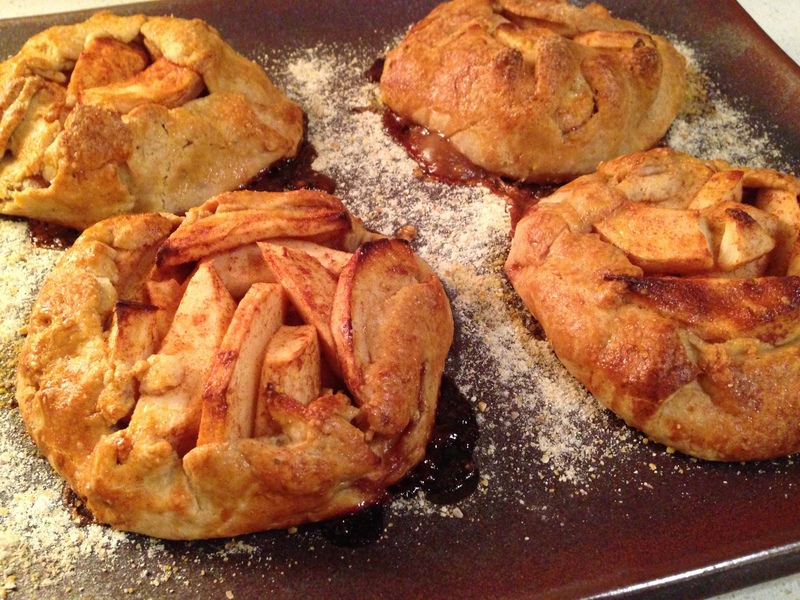 Give the filling a quick stir to redistribute the juices, then scoop into the center of each pastry. Gently fold up about 1-2 inches, pinching each fold together to ensure a decent seal. Bake 15 minutes, then turn heat down to 350 degrees F.
Check the pastry in about 20 minutes; if the crust is browning excessively, cover with foil. 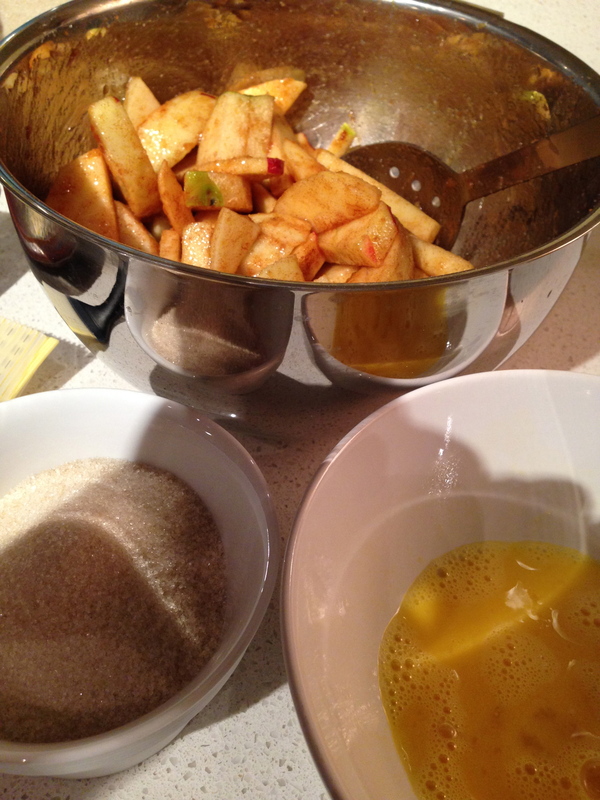 Cook another 15-20 minutes; apples should be juice and bubbly at this point.